In April/May 2014 I visited two countries in East Africa, Ethiopia and Djibouti on a private tour organized by Image Ethiopia. The organization was excellent, everything worked like clockwork. I was very pleased with this company and can wholeheartedly recommend them. After arriving in Addis Ababa in the evening, I stayed at a hotel for the first night. Early the next morning I flew to Aksum. Aksum was the first capital of Ethiopia. I visited several markets for household goods, food, and animals. The colorful baskets were very impressive. Then we visited various sites around Aksum, including the Aksum Stelae. In the afternoon there was a huge Palm Sunday procession. In the evening there was a big Palm Sunday ceremony at the Church of Our Lady Mary of Zion. Before sunrise the next morning we went back to the Church of Our Lady Mary of Zion for the Palm Sunday celebration. This is a huge event, there were probably 20,000 to 30,000 people in Aksum for this celebration. In the afternoon we visited more sites around Aksum, including the Aksum Kings Mausoleums (6th century), and the Queen of Sheba Palace (7th century, not really associated with the Queen of Sheba). The next day we drove to the Simien Mountains. The drive was very scenic. I stayed in Debark for one night. The next morning we drove into the Simien mountains park. We observed Lammergeiers cracking bones by dropping them onto stones and saw Gelada Baboons, an endemic species of monkeys, that is found only in the Ethiopian mountains. It was quite spectacular. After lunch in Debark we drove to Gondar, the second capital of Ethiopia, where I stayed for one night. The next morning we visited the Fasil Ghebbi (the Royal Enclosure), from which the emperors once reigned. There are palaces build by several of the Gondar kings in that area. In the afternoon we continued on to Bahir Dar. On the way we saw a lot of bird life. I stayed in a hotel on Lake Tana for two nights. In the morning after the first night in Bahir Dar we drove to the Blue Nile Falls. After lunch we took a boat on Lake Tana to the Zege Peninsula to visit Ura Kidane Mehret, a 16th century church with beautiful paintings. The next day we drove to Lalibela, again a very scenic drive. I stayed two nights in Lalibela. Lalibela is famous for its rock-hewn monolithic churches. They are definitely worth a visit. The next day I flew back to Addis Ababa, where my new guide picked me up. I insisted on visiting the National Museum of Ethiopia to see Lucy, the 3.2 million year old Australopithecus afarensis fossil, and other hominin fossils. In the afternoon we drove to Lake Awassa for one night. The next morning we visited the fish market. There are dozens of Marabou Storks hanging around the fish market, waiting to feed on scraps or stolen fish. After the fish market visit we drove to the Bale Mountains, to stay in Goba for two nights. After the first night, we drove up onto the Saneti Plateau for a whole day of wildlife watching. After the second night we had another excursion in the Bale Mountains to the National Park at Dinsho. 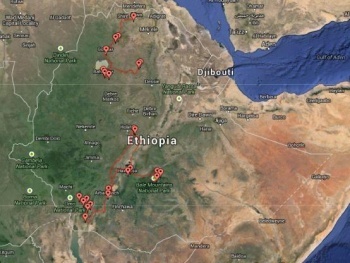 I was very much looking forward to visit the Bale Mountains and the Saneti Plateau. There are many endemic animals in these mountains, foremost the Ethiopian Wolf (Canis simensis, german: Äthiopischer Wolf, french: Loup d'Abyssinie). I really wanted to see them, and I did. Altogether I saw eight wolves. The species' current range is limited to seven isolated mountain ranges at altitudes of 3,000-4,500 m (9,800-14,760 ft), with the overall adult population estimated at 360-440 individuals in 2011, more than half of them in the Bale Mountains. I was very glad that I was fortunate enough to see so many of these rare animals. Other endemic species that I saw in the Bale Mountains were Mountain Nyala (Tragelaphus buxtoni, german: Bergnyala, french: Nyala des montagnes), Big-headed Mole-rat (Tachyoryctes macrocephalus, german: Riesenmaulwurfsratte), Blue-winged Goose (Cyanochen cyanoptera, german: Blauflügelgans, french: Ouette à ailes bleues), Rouget's Rail (Rougetius rougetii, french: Râle de Rouget), Spot-breasted Lapwing (Vanellus melanocephalus, french: Vanneau d'Abyssinie), and Wattled Ibis (Bostrychia carunculata, german: Klunkeribis, french: Ibis caronculé). It was fantastic! In the afternoon we drove to Arbaminch for one night. The next day we drove to Jinka. On the way we visited a local market. This is a tribal area were most people wear traditional clothes. It was very interesting to visit the local markets. I stayed in Jinka for two nights. After the first night we drove to the Mursi village. The Mursi are famous for the lip disks that women have. After the second night in Jinka we continued on to Turmi, again with visits to local markets on the way. The next day we drove back to Arbaminch. On the way we visited a Gamole village, which was very interesting. I stayed two nights in Arbaminch. After the first night we visited a Dorze village. One of their specialty is wool and fabrics. In the afternoon We took a boat ride on Lake Chamo. he wildlife on that lake was great, lots of birds, plus hippos and crocodiles. The next day was a long, scenic drive back to Addis Ababa for my last night in Ethiopia. The next day I continued on to Djibouti for a short four day visit. Ethiopia has a lot of ancient historical sites. The Kingdom of Aksum was the first large kingdom that encompassed Ethiopia. It existed from ~100 - ~940 CE. Its official language was Ge'ez. Ge'ez is still the liturgical language in churches. The Ethiopian script was developed specifically for Ge'ez. It is still used in the current Ethiopian language, Amharic, which descended from Ge'ez. The Kingdom of Aksum grew from the proto-Aksumite Iron Age period c. 4th century BCE to achieve prominence by the 1st century CE, and was a major player in the commercial route between the Roman Empire and Ancient India. The Axumites erected a number of large stelae, which served a religious purpose in pre-Christian times. One of these granite columns is the largest such structure in the world, standing at 90 feet. Under Ezana (320–360) Aksum adopted Christianity, introduced by Saint Frumentius. Some of the earliest Christian sites are in Ethiopia. The main port of the Aksum Kingdom was Adulis, now located in Eritrea. After the end of the Kingdom of Aksum, the Zagwe dynasty was the major kingdom in present-day northern Ethiopia. Centered at Lalibela, it ruled large parts of the territory from approximately 900 to 1270, when the last Zagwe King Za-Ilmaknun was killed in battle by the forces of Yekuno Amlak. Yekuno Amlak founded the Solomonic dynasty, also known as the House of Solomon, which ruled Ethiopia till 1974, when the last emperor, Haile Selassie I, was deposed. The capital moved to Gondar, starting with Susenyos in 1606. Ethiopia is very religious. The religious festivals like Palm Sunday and Easter are huge celebrations in Ethiopia. Aksum actually claims to have the original Arc of the Covenant, containing the actual tablets that Moses received. It is said to be located in the Chapel of the Tablet, on the grounds of the Church of Our Lady Mary of Zion. Ethiopia has developed several stylized variants of ceremonial crosses. In general, the Lalibela crosses are oval, the Gondar crosses are circular, and the Aksum crosses are most similar to the shape of a cross. Agriculture is the main occupation in Ethiopia. The plains around Gondar are very fertile, they raise three crops per year. Other areas are much less farming and are occupied by herders. Everything was fairly clean, much cleaner than in many other countries in Africa. In the tribal areas, most men carry rifles. Apparently there is a lot of cattle theft from competing tribes. Except for Addis Ababa, traffic was not bad. Driving was fairly decent, nothing outrageous, except for the Isuzu trucks. My guide called them "Al Qaeda", because they create havoc on the roads, being involved in many accidents. Between their bad conditions and bad driving, they deserve their name. The food was OK, nothing special. In the smaller places, the food was simple. You eat with your hand, no utensils. Beer was reasonable, not as inexpensive as in some African countries. It usually came in small bottles (0.33 l (0.35 quarts)) which cost $1.00 to $1.50. What I really enjoyed were the juices. They had various fresh juices, sometimes pressed as ordered, from various fruits and vegetables. They were really great. My accommodations varied from simple hotels to one fairly luxurious lodge. In general, the accommodations were OK, except for Arbaminch. The hotel there had fairly bad service. The water didn't run, it just dribbled. It took several hours to fill a bucket for washing. They were playing extremely loud music till late. Other than that, I was happy with the accommodations. I had a fantastic trip. Ethiopia is certainly worth a visit. There is lots of bird life everywhere. In the parks there is fantastic endemic wildlife. I was especially pleased to see the Ethiopian Wolf. The tribal areas in the south are very interesting to visit, as are the historical sites in northern Ethiopia. Overall it was a great experience.